Like it or not, Kasabian are 2017's biggest British rock band. Each of their last four albums to date has gone to number one, while only they, Arctic Monkeys, and the limper-than-ever Libertines are the only such artists to be part of that ever-slimming rotation of bands considered worthy of whipping crowds of a hundred thousand into appropriate shape as a festival headliner. And they talk a good game too. Kasabian have always had a certain knack of owning their arrogance, bemoaning the lack of swagger in modern rock while relishing the fact that those who dismiss them as mere lad-rockers are simply ignoring their hidden depths. "It makes your surprising moves more powerful. If people really aren't expecting you to have any depth, when you do something people are like, 'Oh I didn't know they were capable of that'," boasted Serge Pizzorno when interviewed by NME ahead of the release of their latest album, For Crying Out Loud. 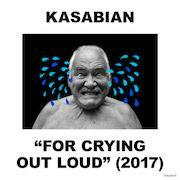 What a shame then, that For Crying Out Loud is Kasabian's most predictable record to date, as brash, unsophisticated and just plain dull of a listen as they've ever produced. The band's sixth outing is everything their detractors might expect: ploddingly calculated “anthems”, lyrics that veer between affected confrontation and pure meaninglessness, and an abundance of filler. I maintain that Kasabian's self-titled first album was actually quite good when it appeared amidst a musical mainstream awash with guitar bands in 2004. Nothing epochal, sure, but there was an authentic sense of strangeness to the group's output, infusions of kraut and psych that, though watered down significantly, lent at least something of an edge to the anchor of straightforward indie-pop that has come to define it since. The likes of 'Test Transmission''s motoric psychedelia and 'U-Boat''s whacked-out sprawl were at the very least interesting, while 'Club Foot', 'Processed Beats' and 'LSF', for example, were among the more passable of the era's abundance of indie disco staples. Even their last record, 2014's 48:13, had a bit of personality to it. It was an ill-advised idea from the start, from its garish pink cover and minimalist title and track names' brashly misfired attempt at 'iconic' to its frenetic, unfocused songwriting: not a good listen, but there was something at least a little engaging about the sheer self-indulgence of it all. For Crying Out Loud is notable only for its lack of these limited strengths. It is utterly bereft of personality while what experimental edge they once had has long since faded. While many Kasabian albums have been bad, none have been quite this mind-numbingly boring. Yet the band themselves seem to think that their lack of imagination is in fact a sign of their ability to write a traditional 'classic': "I'd heard Berry Gordy had said if you've not got them in the first four bars then you're finished, so I went in with this old school attitude of song-writing," says Serge. The reason Kasabian have managed to maintain their mass appeal is not, in fact, because of their songwriting. They've written nothing that shows much nous for a pop single since West Pauper Ryder Lunatic Asylum, released a decade ago. The successive Velociraptor and 48:13 both lacked a hit single like 'Fire', 'Vlad The Impaler' or 'Fast Fuse', but still managed to translate their brash, uncompromising arrogance to their sprawling, directionless sound, regardless of whether the critics cared for it. Yet For Crying Out Loud lacks the crucial component to Kasabian's swaggering steam train of a career, the swagger. The opener, 'Ill: The King' is the sole exception. A loud, dense stomp of a song over which frontman Tom Meighan brainlessly spits lyrics like "Fetch me a milkshake, don't forget the straw" as he throws down an empty gauntlet to his contemporaries. It's not a very good song, but at least it's cringe-worthingly brash. It makes you feel something, even if that something is a mixture of repulsion and despair. All the rest of the record makes one feel is pure, unadulterated boredom. It is not even sprawling and directionless but just painstakingly mediocre throughout. There's a satisfying squall to the guitar solo at the end of 'Twentyfourseven', and the hubristic horns that open 'Comeback Kid' are almost refreshingly brash, but on both counts they soon slip back into an unimaginative, affected stomp, bereft of texture and replete with predictability. 'Bless This Acid House' is the record's particular nadir, and the starkest illustration of what's wrong with the new Kasabian album. Shooting for anthemic but landing in some unhappy medium between a limp imitation of Primal Scream's Give Out… and every 'summer anthem' a team of faceless major label songwriters could ever try to conjure. Say what you like about Kasabian but never have they been this pedestrian, predictable, and so utterly, utterly bland. "I made sure there was no fat on anything, it was going to be classic songs, no self-indulgence, nothing was going on there that shouldn't," continues Serge in the album's press material, forgetting, it seems, that self-indulgence was all Kasabian really had going for them. In mistakenly considering himself capable of a 'classic', he's come out with the kind of material that Kasabian's detractors have always accused them of, but of which they were never really guilty: lad-rock.